Google is making it easier than ever to spend all of your hard-earned cash shopping online. This is something most of us do on a regular basis, but shopping online isn’t always as simple and stress-free as it should be. Google thinks it has the answer in the form of Pay With Google. Pay With Google is essentially a new payment option which will appear when you want to buy something from an online retailer. Google’s new offering will let you use any credit or debit card you have previously added to your Google account through Android Pay, Google Play, and YouTube, etc. 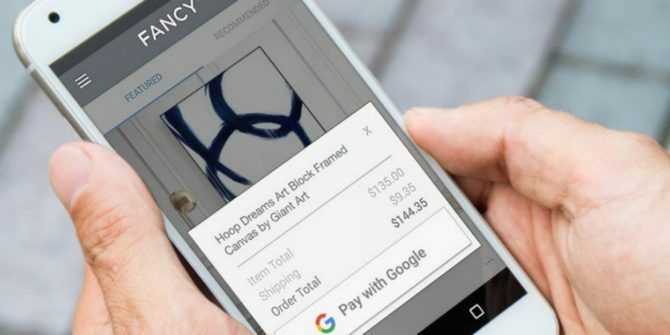 If you opt to Pay With Google, you can choose the card you want to use, and Google will send your payment information and shipping address to the merchant. The merchant will then take over, but with Google having saved you the time and effort of typing out all of your details again. Google’s new offering won’t yet work with every app on every platform. Instead, at launch, it’s available on Android apps such as Instacart, Kayak, DoorDash, Eat24, iFood, and Postmates, or on the web through Google Chrome. Other big-name online retailers are adding support soon. This isn’t going to revolutionize online shopping 7 Interesting Stats on Modern Online Shopping Habits 7 Interesting Stats on Modern Online Shopping Habits Online shopping is taking over the world. Here are a few mind-boggling statistics that prove it. Read More , but it is a step forward for those of us who are sick and tired of filling out forms for every single app. And while it does mean keeping payment information on file, keeping it on file with one company surely beats keeping it on file with dozens of different companies. Any one of which could spring a leak at any moment. What do you think of Pay With Google? Do you like the idea of Google storing your payment details? Or do you think this is a security nightmare in waiting? Can you see yourself using Pay With Google to save having to fill in another form? Please let us know in the comments below! So now I should let Google track my online shopping habits? !